The world famous Stonehenge is situated around 90 miles west from Central London and is well within a comfortable day trip. The nearest town with good public transport and facilities is Salisbury, a medieval cathedral city. Worth a visit in its own right. About 24 miles north of Stonehenge is Avebury, another World Heritage Site with even larger stone rings to Stonehenge and unlike Stonehenge with free access to the stones themselves. From a central London hotel its just under two hours one way to Stonehenge by vehicle. Most visitors stay at Stonehenge around one hour. Stonehenge can be visited independently using public transport but overall this will not be much if any cheaper than taking a tour. The easiest way to get to Stonehenge is by guided tour. Your problem here will be the vast choice available from London daily. Visiting by guided tour is no more expensive than travelling independently. 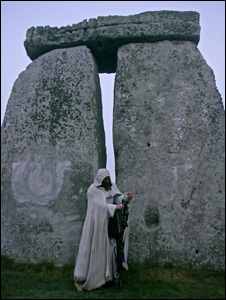 The Stonehenge Travel Co – Stonehenge Guided Tours from Salisbury. Highly recommended private bespoke tour company based in Salisbury. Take the M23 motorway and join the M25 motorway, following the signs for Heathrow Airport. From the M25, exit at junction 12 for the M3 motorway towards Basingstoke. Once on the M3 follow it to junction 8 signed A303 Andover. Continue on the A303 ALL the way until you reach a roundabout. Go straight over this and 2 miles on bear right onto the A344 and the car park is on the right hand side about 500 metres on. Follow signs to the M4 West. Continue for about 2 miles and come off at junction 4b onto the M25 South bound. Follow the signs for Gatwick Airport. From the M25, exit at junction 12 for the M3 motorway towards Basingstoke. Then follow the directions as above. Check for times and prices as these may be subject to change and the trains depart approximately every hour. The journey takes about an hour and a half. Local buses or a cab can take you on. The buses depart from Heathrow Airport and from Victoria Coach Station in the centre of London. The journey takes about 2 hours. From there you can either walk (about 2 miles), catch a local bus, or get a taxi. You can buy tickets on the coach, at the coach station, or from ticket agents for National Express. It is the cheapest way to travel to Stonehenge.If you are coming from Gatwick Airport you will need to first get to Heathrow Airport or to Victoria coach station (you can do this by bus) and from there change buses to Amesbury. Toilets: WC adapted for wheelchair users in large toilet block at far end of car park. Refreshments: Light refreshments are available from the Stonehenge Kitchen. Access: On tarmac and grass path around outer circle (subject to weather conditions). One wheelchair available to visitors on request at entrance kiosk. Reserved parking for disabled drivers is available close to entrance. Ticket office reached by short, sloping tarmac path. Braille and large print guides are available on request. Touching Stones accessible at the main entrance. Audio tour with hearing loop in ten languages (subject to availability). Audio guides are complementary and available in ten languages and hearing loop subject to availability. Audio guides are not available for qualifying educational groups – please visit the educational resources page for downloadable educational resources. Guidebooks are also available in French, German, Spanish and Japanese; large print and braille guides in English only. Hot and cold refreshments available throughout the year. Stonehenge is surrounded by 1,500 acres of land owned by the National Trust, with excellent walks.